The design of a wind turbine varies depending on the site where it will be located, the budget allotted to its construction, the materials available, and many other factors. 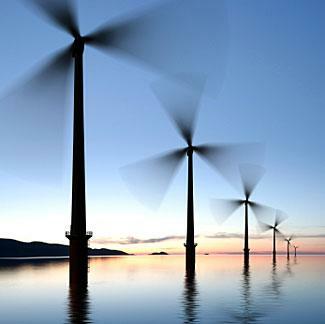 The ideal design allows the wind turbine to capture the most energy possible from the wind. They are elevated on a tall post or "tower." This allows them to reach wind currents that are traveling at higher speeds. 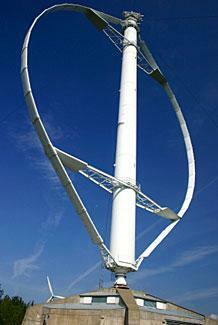 They have some type of rotational device, such as blades, to capture wind energy. They have electrical generators, which converts the kinetic energy of the wind into electrical energy. Most are made from steel. Most of the wind turbines you see in wind farms and individual settings are horizontal axis wind turbines (HAWT). These turbines resemble giant fans and usually have three blades. The blades turn a rotor shaft, which is attached to an electrical generator. The generator converts the wind energy into electricity. 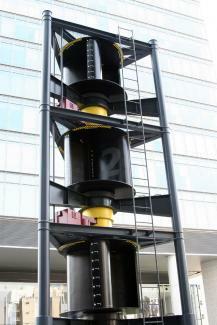 The electrical generator is located at the top of the tower, and it is usually accompanied by a gearbox. The gearbox increases the speed of the generator. The location of these mechanical items can make this type of turbine difficult to service. These turbines have some type of device that turns the blades into the wind. In lower-technology or older models, this may be a simple tail wind vane. In modern models, it's likely to be a computer. The towers for these turbines are usually two or three times the length of the blades and often reach as high as 300 feet. The towers are made out of tubular steel and may be transported from the manufacturing plant to the site in multiple pieces. The most efficient HAWTs operate at variable speeds, allowing them to collect more energy on especially windy days. The blades are tapered and are typically a light gray color. They are often up to 130 feet in length. They blades can be angled into or out of the wind to stop rotation and help protect the turbine during storms. Most HAWTs also feature a braking system to stop rotation if the force of the wind becomes too great. Typically, trucks take the components of HAWTs to the site where they will operate. Workers then construct the turbine on-site. In some cases, especially in mountainous regions or in Europe, the height of the turbine is limited by the roads the truck must travel with the long blades. In a Darrieus wind turbine, two or more steel blades curve up from the bottom and meet again at the top of the center shaft. These are named for Georges Darrieus, a French inventor. They resemble part of a helix or an egg beater. According to Scientific American, this design is less efficient than a HAWT. One advantage of Darrieus vertical axis wind turbines (VAWT) is that they can accommodate variable wind speeds and directions. They do not need to be turned into the wind, like horizontal axis wind turbines. This makes them ideal for sites with unpredictable weather patterns. Typically, the gearbox and electrical generator for these turbines is located on or near the ground. This makes them much easier to service than HAWTs. 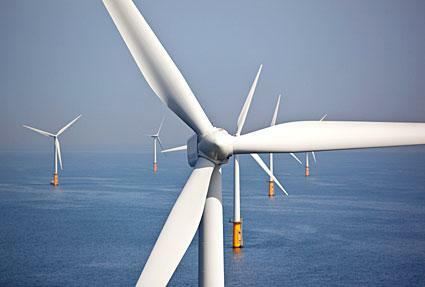 Because of their design, these turbines are under greater force from the wind than HAWTs. This means that components need to be sturdier and are typically more expensive. Additionally, this force also decreases the reliability for these models. This type of design is ideal for a rooftop, since the turbine is already elevated and requires a shorter tower. Many older Darrieus VAWTs are supported by guy wires, but newer models may have a steel support structure. These turbines often require a separate power source to begin rotation. The Darrieus VAWTs are also manufactured in pieces and then constructed on site by technicians. Similar in many ways to the Darrieus VAWT, the Savonius VAWT features a center rotating shaft, which usually has a number of aerofoils. Invented by Finnish inventor, Sigurd Johannes Savonius, the Savonius VAWT is more reliable than the Darrieus VAWT. Savonius VAWTs do not need to be pointed into the wind, so they are ideal for sites with variable wind direction. Unlike the Darrieus VAWT, the Savonius VAWT can start itself, so it does not require a separate starting motor. Savonius VAWTs are typically constructed of steel, but the aerofoils may be made of other materials. Most Savonius VAWTs are manufactured in pieces and then constructed on site. Smaller models may be entirely factory-constructed. How much variability is there in the wind direction? If the wind comes from one direction most of the time or shifts once in a while, a HAWT might be the most efficient choice. If the wind is unpredictable, one of the VAWT may be better. How windy is the site? If the site gets a lot of wind at lower altitudes, a VAWT might be perfect, as long as the wind speed did not exceed the manufacturer's recommendations. If the wind is constant but not strong, a taller HAWT may be able to capture more of its energy. How high can you build? As you go up in altitude, the power of the wind becomes greater. However, this also creates greater strain on the tower and requires that the tower be thicker to support the blades against the wind force. There may be local regulations to consider. What is your budget? Because they require direction-changing technology, large HAWT can be quite expensive. Smaller VAWT may be better for individual applications. This report from the National Renewable Energy Laboratory examines how design changes can affect the cost of a wind turbine. Otherpower.com offers more tips for choosing a wind turbine design that's right for your situation. Whether you're considering building your own wind turbine or simply want to know more about the workings of these amazing machines, learning about the different types and designs can be very interesting. Wind turbine companies are constantly producing new technology, so there's always more to research about this fascinating topic.